Designed with the fantasy player in mind, this membership allows you to build your own 30 man roster and using Visual Memory Index principles, help determine the player's effectiveness for the given day's game. This membership allows you to see today's and tomorrow's team VMIs. (Non-members can only see history.) Additionally, for all the players in your roster, you can view their personal VMIs (which can differ based on games played or missed, trades, etc.) as well as their most recent games' VMI graphed with their batting stats. Pro Package Membership* - $49.95/yr. Designed with extended features in mind, this membership builds on the Standard Membership and provides detailed daily, custom, personalized tips based on your VMI and the opposing team's pitcher. The detailed tips discusses your current VMI, the movement to expect in the current days' game and reminders about how you deal with additional or lesser movement in varying VMIs and venues, given the opposing pitcher's speed. As well as additional tools and reports, you will also be provided with the current graph of your Pro Player's personal VMI vs. AVG, OBS, SLG and OPS. * This package provides detailed VMI tips for one designated Professional Player. After choosing up to 30 players for your roster, members can display each player's VMI based on their previous games and current game location. 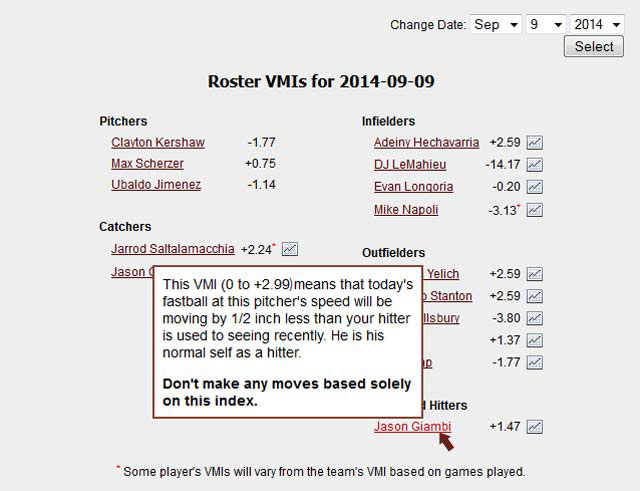 The VMIs displayed are the player's personal VMIs which may differ from the team's VMI based on games played or missed. As can be seen in the example, a short explanation of how today's VMI may affect the player is shown in the mouseover pop-up. The graph icon also provides a batting stats graph. The current day's Professional Tip is available on the Member's Home page at approximately 5AM each game day. 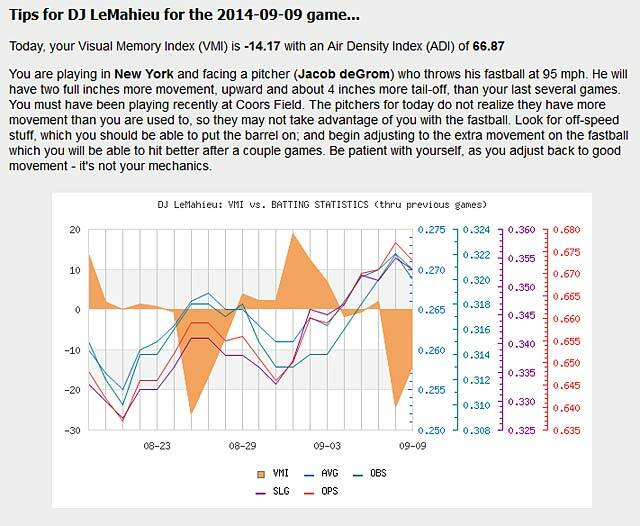 The following example is what DJ LeMahieu would have received on the day of Sept. 9, 2014. Note that the detailed tips for that day's game are discussed along with opposing pitcher and current venue. The graph of his last 20 days Personal VMI are plotted against Average, On-Base Percentage, Slugging Percentage, and On-Base plus Slugging. The T-L-R Report is essentially a Top 50 for Pitchers. 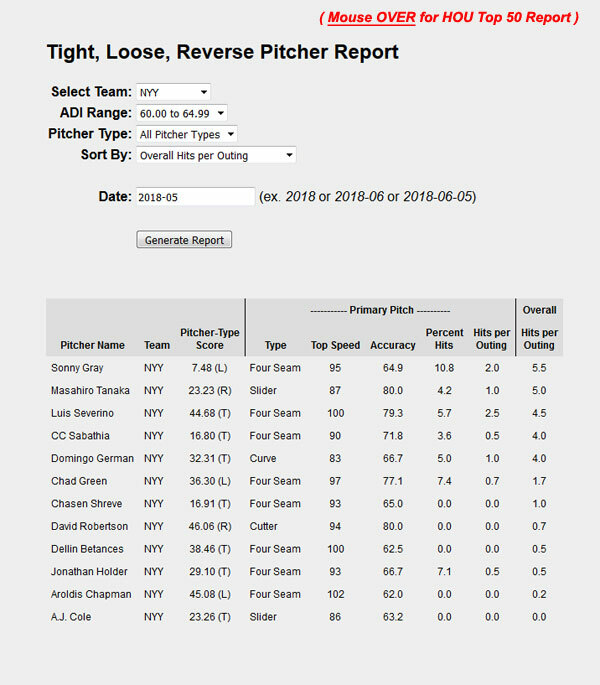 Yes, you can query the entire database for pitchers and sort them by ALL - or Tight - Loose - Reverse to see who is currently listed as the best or worst for your particular purpose. But don't stop there...! You can also pick today's match-up in the ADI, and compare the Home Team's Pitchers against the Visiting Team's Top list of hitters within today's VMI. 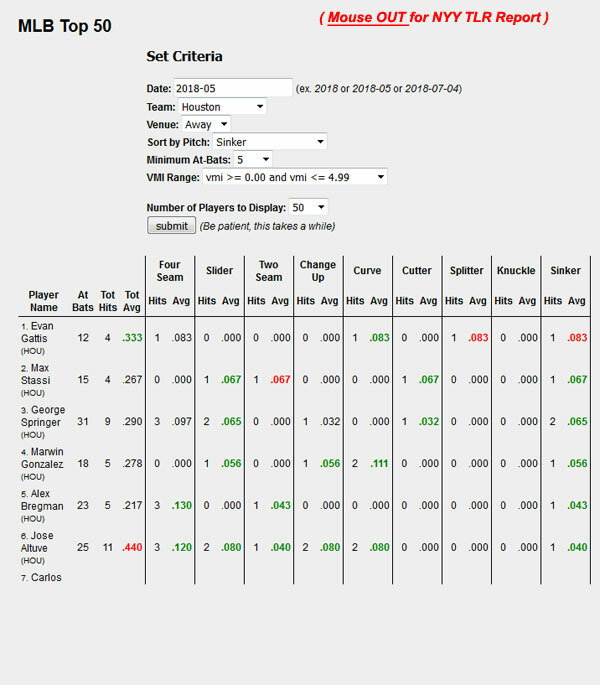 So, select the T-L-R Report and set the Criteria to get ALL one team's Pitchers; then, open (in a new tab or window) the MLB Top 50 hitters and select the opposing team and sort by the type of pitch the set-up man will use (the example is sorted by Sinker); to see who floats to the top by his pitch-type. Then sort by the Closer's best pitch to look at who may hit the closer the hardest. If your screen is large enough, you can move the windows side-by-side. Then, pray the manager chooses the right set-up man.